10ft Exhibit Line Displays	There are	26 products. 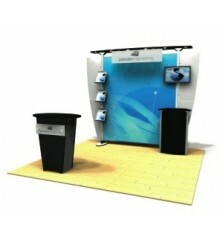 10ft Exhibitline Displays continue to be our top selling brand-name display booth. 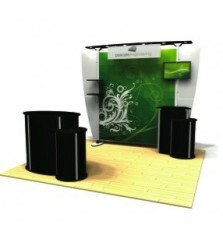 Enjoy FREE Shipping on exhibitline 10' x 10' display orders. This ultra-modern trade show display features an attractive simplistic design that's the most contemporary and stylish user-friendly modular display product line on the market today. In additional to the dynamic eye-catching engineered designs from exhibitline, portability and simple tool-free assembly make this trade show display brand attractive to every modern exhibitor. All of our 10x10 Exhibitline Displays include an impressive dye sublimation mural graphic made from anti-wrinkle poly knit fabric and silicone beading that's attached to each side giving the display a clean seamless look. You can choose the straight ex laminate canopy or the slightly curved eb laminate canopy for your 10ft exhibit line display. Laminate finishing includes 5 stock color options but you have the option of choosing from an endless amount of custom laminate options. Exhibitline trade show accessories are available to complete or reconfigure your custom modular trade show display. Accessories include laminate or brushed aluminum product shelving, attachable literature holders, multiple monitor mounts options (mount 19" to 50" monitor), profile cut graphic accent wings & custom graphic header shapes, internal LED lightbox illumination, NLC locking modular counters, laminate slatwall panels, tablet (iPad, Surface, and others) attach mounts, and more. IndyDisplays.com also offers the latest exhibitline counters and exhibitline monitor stand kiosks that can be added to any booth space. Brand-name exhibitline portable reception desks, monitor stands, modular workstations, and trade show kiosks include laminate counter tops (5 standard laminate colors), graphic infill panels, locking iPad features, stand off graphics, and secure locking storage. All exhibitline display products include integration technology. You can easily find additional exhibiting ideas through our online trade show displays catalog, such as a tension fabric branded flat wall display or retractable banners, plus reconfigure a 10' exhibitline into a 20ft exhibitline display kit or larger modular island exhibit by simply adding additional hardware and trade show graphics. 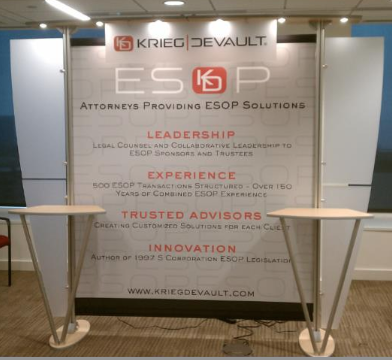 trade show cabinets and monitor kiosks can be used as free-standing exhibitline accessories in a booth space or attached to a aluminum modular backdrop booth.